I am a big fan of Sunday lunch, and on a windy, rainy, Edinburgh day I can think of few things better than sitting down to a tasty, three course feast. As luck would have it, it was a east coast day just like that when I ventured to Steak, the restaurant belonging to No. 12 Picardy Place at the top of Leith Walk. The restaurant is headed up by Chef Jason Wight and does exactly what it says on the tin. Their tagline, “where beauty meets the beast” is quite true. 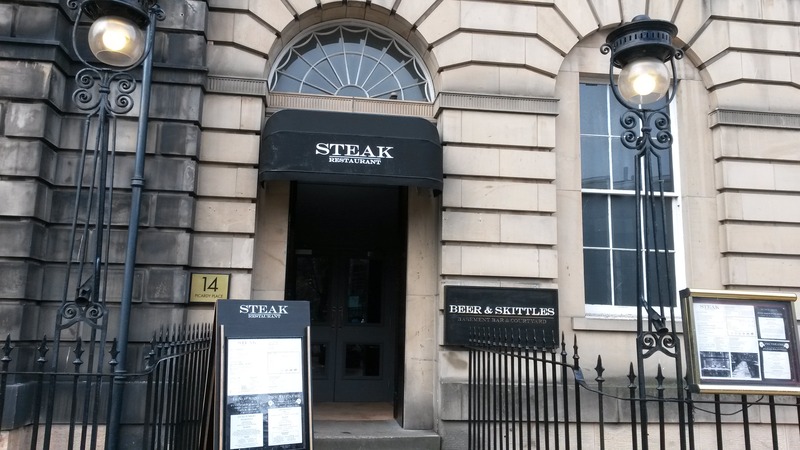 On entering you are given a glimpse of the quirky, boutique style hotel at Picardy Place, and at the end of a dark, luxurious entrance hall you find Steak. The restaurant space is dramatic to say the least – a large, completely open hall, finished with beautiful traditional cornicing. 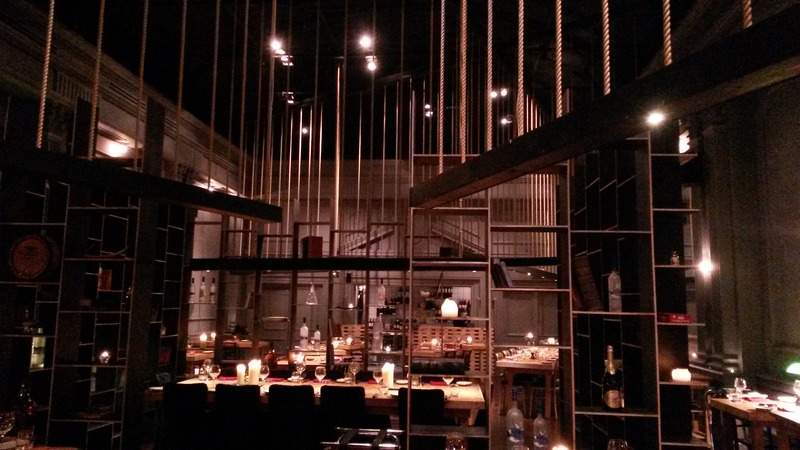 Stylish cast iron rods are suspended mid air by chunky ropes and these fill the vast space above the tables to the high ceiling. 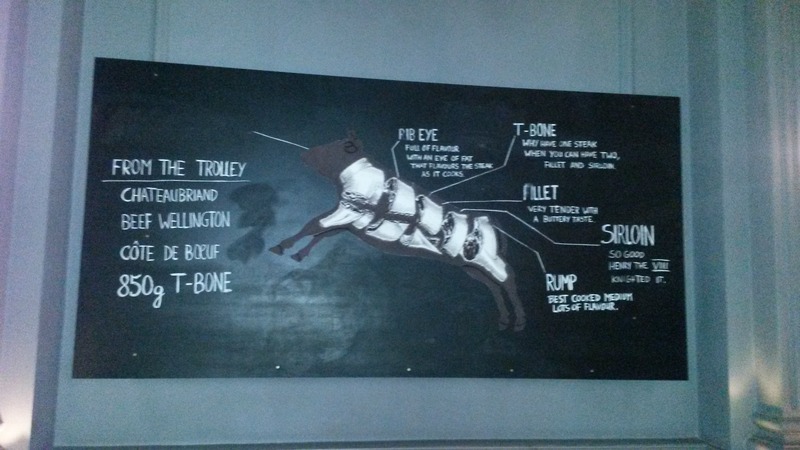 On the wall as you go in there is a chalk board with a detailed drawing of “the beast”, explaining exactly where all the different cuts of meat come from on the animal. Some people will love this, others will hate it, but I thought it was quirky and if I’m honest, helpful! After ordering we were offered warm rye, soda or cheese and bacon bread – the third one there was moorishly tasty. To start I enjoyed an apple and walnut salad with blue cheese whilst my other half (that’s other, not better :D) had the chicken and leek terrine. 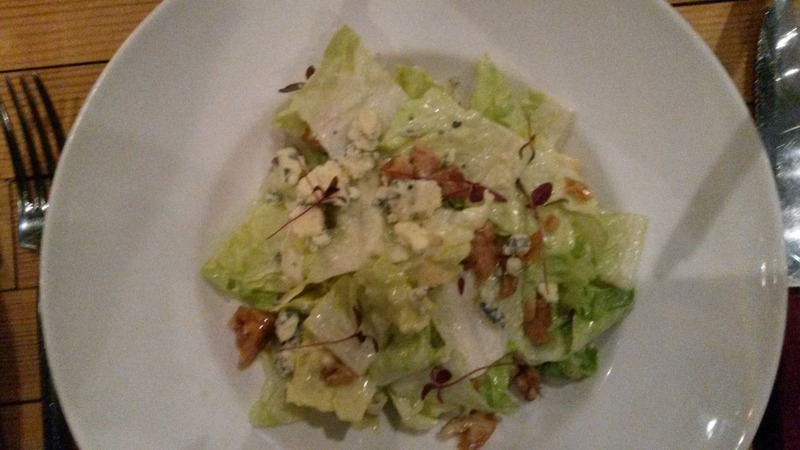 The salad was delicious, little shavings of apple and these lovely pieces of caramelised walnuts, both of which worked really well with the blue cheese. 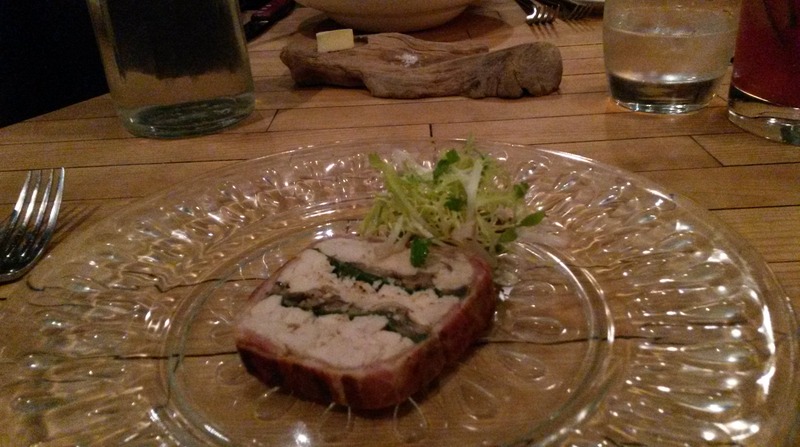 I am told the terrine was “a solid choice”. 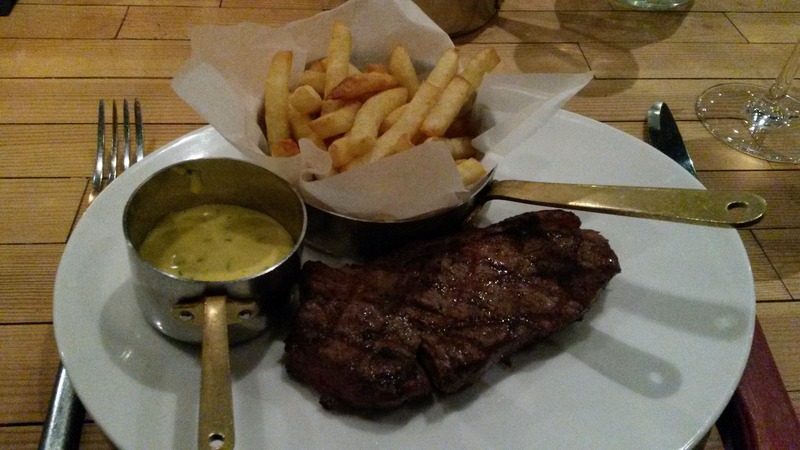 On to the main course, and the star of the show – rump steak frites with béarnaise sauce. I like mine cooked medium, and my other half medium rare. Both were cooked to perfection. The steaks had a lovely charred finish and mine was perfectly pink in the middle, the juices from the meat spilled out onto the plate as I cut into it. The béarnaise sauce was not as garlicky as I expected, but tasty all the same. 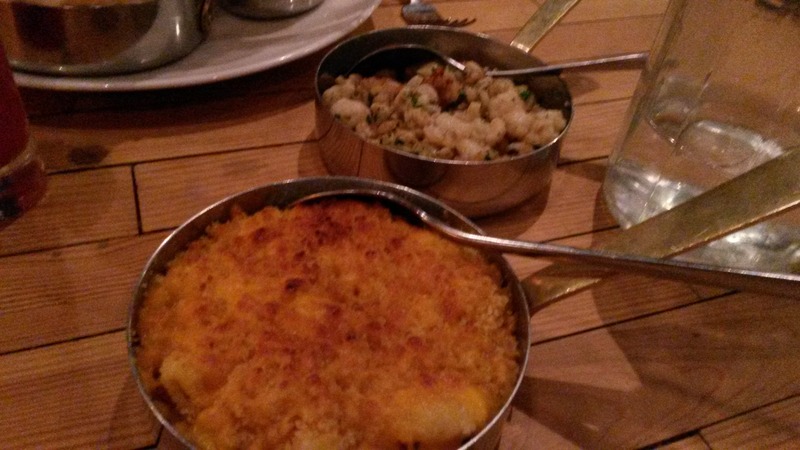 Alongside the crispy chips I tried a side of the parsnip macaroni cheese. In my mind steak and macaroni cheese is a brilliant combination and I never pass up the opportunity to have it. My other half added a surf and turf element to his main by trying the side of cauliflower and shrimp. This was not a combination I’ve thought of before, but I can assure you it went down a treat and will be replicated soon as home I’m sure! We probably didn’t need anything else but decided to go for it anyway. 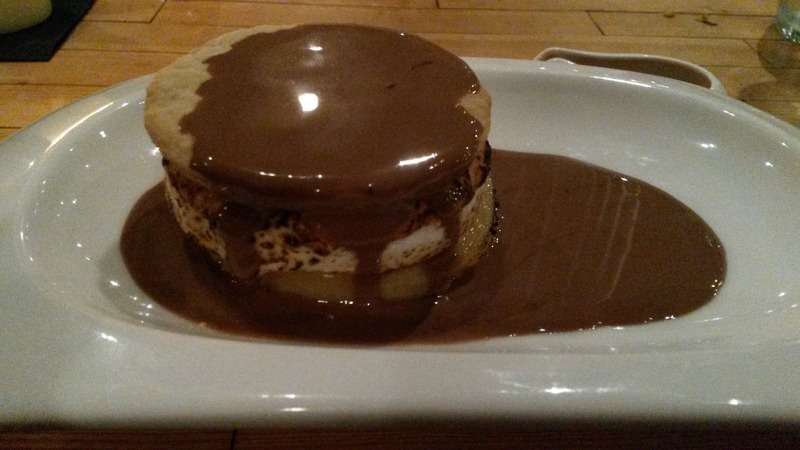 I tucked into a peanut butter smore with hot chocolate sauce (*admission* I chose this one from the a la carte menu, the lunch menu included peach cobbler). You’ve got to have a sweet tooth to enjoy this dessert, and for chocolate lovers like me it was fantastic. The marshmallow in the middle honestly tasted like it had been toasted over an open fire, and the hot chocolate sauce was delicious with the cold peanut butter filling. All in all, quite a delicious experience. Once you add on a couple sides, desert and a glass of wine, the bill comes in at about £20 a head. I know this place very well. I worked here as a gaming inspector when it was the Stakis Regency Casino. You’re first pic looks very much like the main gaming floor . . . . happy memories! We were wondering what the building used to be before it was the hotel!